Same, same but different? The all new McLaren 720S is definitely not the same and significantly different from the brands other super serious road-going race cars. 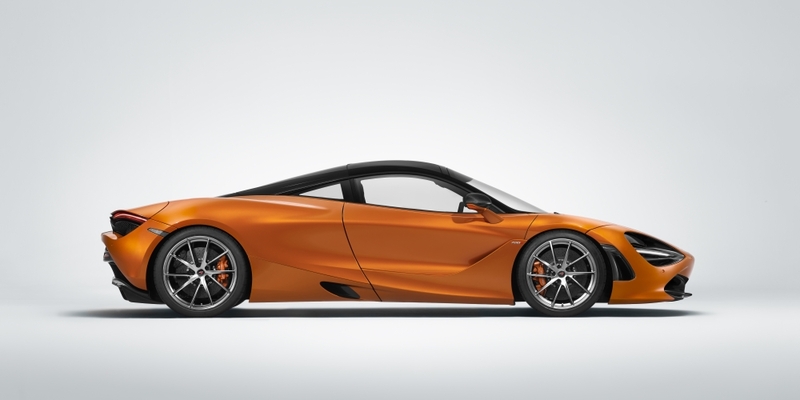 The new McLaren 720S made it's global debut at the 87th Geneva International Motor Show, introducing the second-generation of McLaren’s Super Series and simultaneously raising previously accepted limits of performance in the supercar sector. 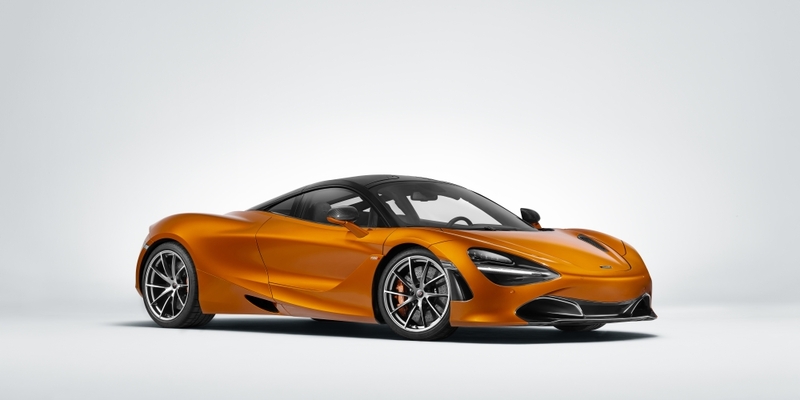 The unveiling of McLaren’s new supercar confirms both the 720S name and 720PS horsepower of the first model in the second-generation McLaren Super Series, details which have been teased online in recent months. The new 720S is lighter, faster and even more dynamically capable than its McLaren 650S predecessor, with unparalleled levels of interior space and sophistication and a breadth and depth of abilities that will engage and exhilarate the driver. One glance at the 720S identifies it as a bold reinterpretation of McLaren’s design language; rooted in aerodynamic principles, the beautiful form has nothing superfluous about it: immediately and undeniably a McLaren, the new 720S is arguably the most distinctive and remarkable McLaren yet. One of the key points in the design of the new Super Series is the absence of radiator intakes on the side of the car; this function is carried out instead by the unique "double-skin" aerodynamic form of the dihedral doors, which channel air to the high-temperature radiators that cool the mid-mounted engine. The new M480T engine powering the 720S continues the lineage of McLaren’s multiple-award-winning, twin-turbocharged V8 engine series. The 4.0-litre engine, which has 41 percent new part content compared to the 3.8-litre engine that continues to feature in the McLaren Sports Series, generates a maximum of 720PS and 770Nm of torque. Performance is truly astonishing: standstill to 100km/h (62mph) takes less than 3 seconds and just 5 seconds later the car has passed the 200km/h (124mph) mark on its way to a maximum speed of 341km/h (212mph). 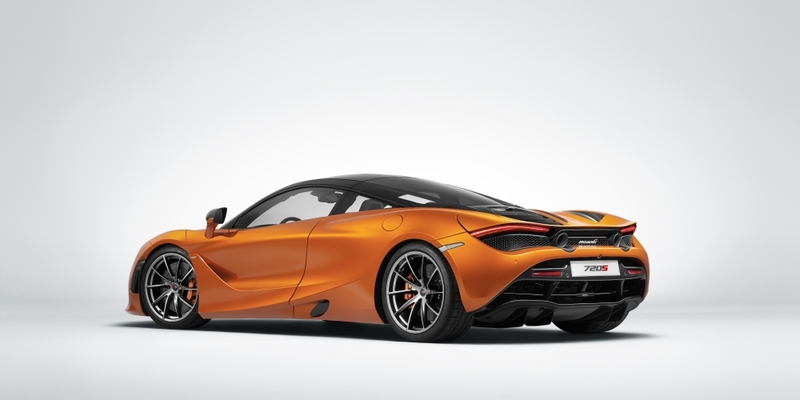 Braking is equally impressive, the new 720S coming to a halt from 200km/h (124mph) in just 4.6 seconds, covering 117m. 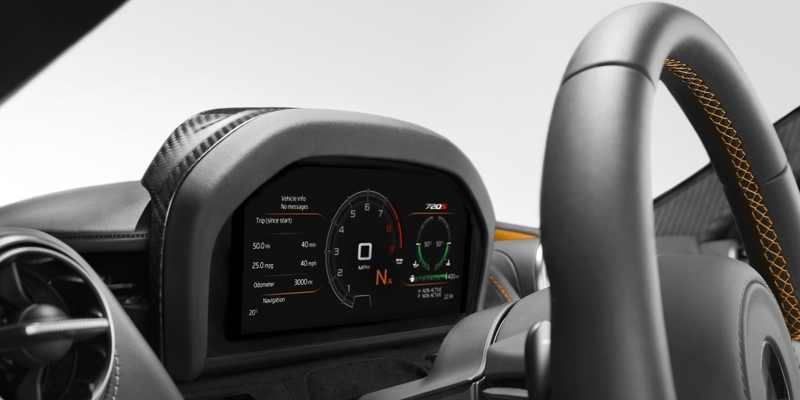 Additionally, the extreme efficiency of the engine also goes beyond mere velocity: the new McLaren 720S delivers 10.7 litres/km combined fuel economy and CO2 emissions of just 249g/km in the New European Driving Cycle (NEDC). 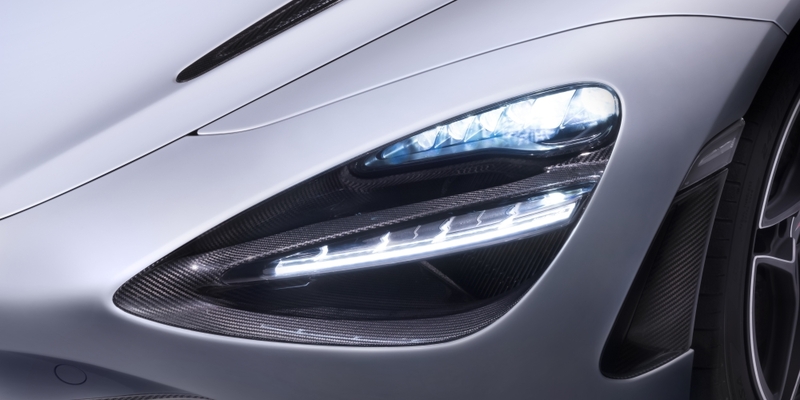 McLaren’s expertise in carbon fibre structures - every road car built by the British manufacturer since the McLaren F1 in 1993 has had a carbon fibre chassis - underpins the construction of the new 720S; the architecture of the car is based around a new carbon fibre "tub" and upper structure, the McLaren Monocage II. This technology delivers extreme strength and rigidity in a lightweight structure and is the ideal base for any supercar. A range of aluminium alloys are also used extensively in the chassis, as well as for some body panels. 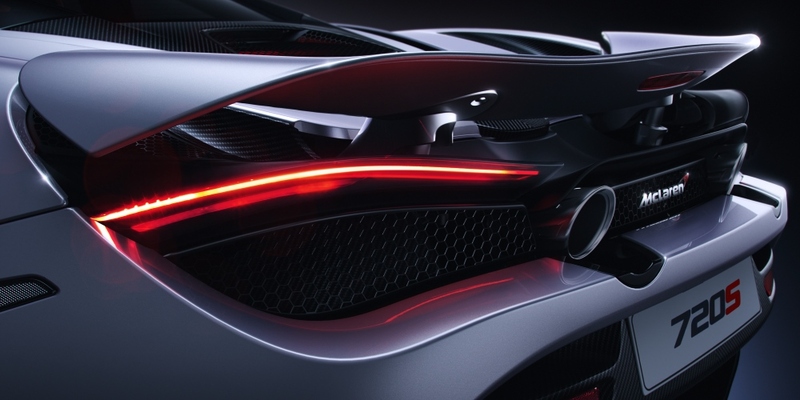 A new generation of McLaren’s Proactive Chassis Control, new suspension and the established excellence of McLaren’s power-assisted, electro-hydraulic steering, all combine to deliver huge reserves of grip, balance and performance and an unmatched breadth of dynamic capabilities. 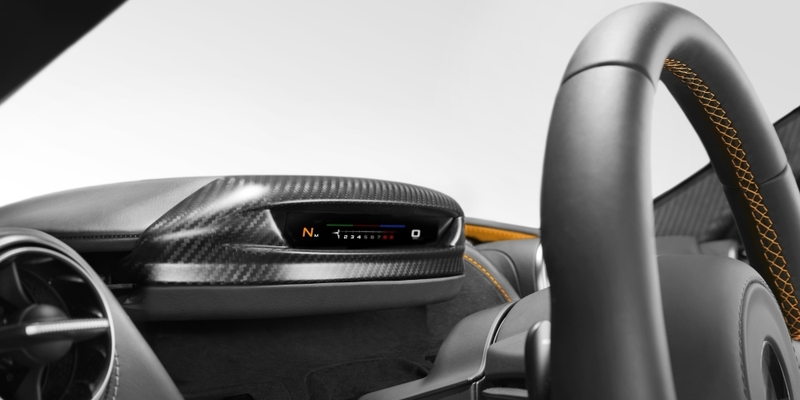 The hand-crafted luxury inherent in a McLaren, with the authenticity of fine leathers and machined aluminium, is complemented by the revolutionary new McLaren Driver Interface, which comprises a Folding Driver Display and Central Infotainment Screen. In combination with a cabin environment that establishes new standards in the supercar segment for visibility, space and comfort, these attributes give the new McLaren 720S an incredible degree of usability and validate its claim to be the most complete supercar on sale today. The new McLaren 720S is now available to order from McLaren retailers, with the first customers scheduled to receive their cars in May. Three grades of specification are offered, with Performance and Luxury trims extending above the standard level, all complemented by a range of option packs.